Sign up for Broadjam today to follow Laughter of the Crowd, and be notified when they upload new stuff or update their news! 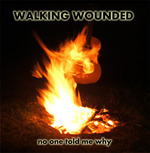 11 Tracks of Original Acoustic-Folk-Rock. Mae rhywbeth allan oi le. Da ni di bod yn ffrindiau mor hir. Dal i gau y drws ar y gwir. Be dwi?n mynd i wneud. Making a fire on the beach - remembering past times you've done the same, and who you were with. And when you leave, the stones set in the sand remain. A song about finding your way home and a girl who hesitates . "time waits for no man"
"Rosemary and Thyme" is written on the wall. Rosemary and Time are passing in the hall. she has a plan to bring her home again. but I couldn?t bring her safely to that shore. Rosemary has time, she?s waiting at the gate. Rosemary, you know that time will make it always be too late. Rosemary, don?t you know that? all that you know can drag you down again. He has a plan to bring you home again. He, he died for me. He set me free from all I knew before. Who has a plan to bring us home again. But only he can bring you safely to that shore. When will I see where you want me to be? And when will I see her again? When will I know where you want me to go? all this time that you give to me. If I will see her again. But some days it just isn't clear. So here I stand with my life in your hands. If I go where your hand will guide. That I will see her again. so I tried to let you go. No-one ever likes to hear those words. I know it?s not the last time I?ll be here. Apologies are useless, but still they fill the air. Now I have to learn to live as if you didn?t care. I don?t know why my heart is petrified. Some things just seem way too hard to do. so I watched her go. I never thought I?d have to say those words. and she turned to walk away. Maybe that?s the way things have to be. How can I ever tell you exactly how I feel? That I think that I might love you but I?m scared it isn?t real. Sometimes it's just way too hard to choose.